When Baron Herbert returns from crusade he grows increasingly morose and withdraws from his family. Then his sons begin to die in strange accidents, and some ask if Herbert harbors a dark sin for which God has cursed him. The baron sends for Sir Hugh of Wynethorpe, begging his friend to bring spiritual and secular healers. Sir Hugh persuades his sister, Prioress Eleanor of Tyndal Priory, as well as a respected physician, Master Gamel, to accompany him. Although Sir Hugh is pleased when the prioress brings her healer, Sister Anne, he is disturbed to find the mysterious Brother Thomas included. Tensions spark among family members and soon ignite among those who came to help. Death's scythe harvests more victims, and it is not long before Ecclesiastes' grim words seem all too apt: there is a season for everything under heaven, including a time to kill. Is there also a time to heal? 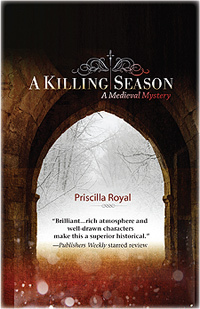 "Royal's 13th-century mysteries are always full of historical detail..."
"Rich atmosphere and well-drawn characters make this a superior historical." "Royal's attention to historical detail and skillful creation of a sinister, chilling atmosphere makes her latest in this series a treat for all mystery readers."